"For Five Years, Extremist Groups Waged A Campaign of Death Threats, Arson and Riots To Stop The Production of "Water." But The Filmmakers Were Not To Be Silenced." 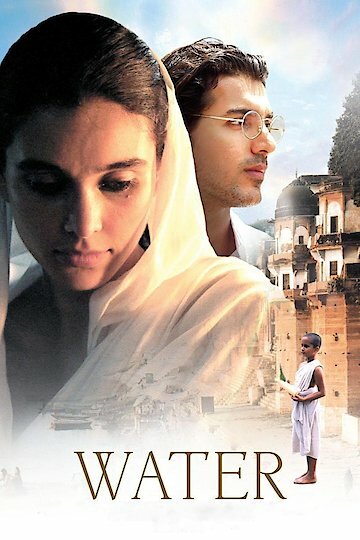 This 2005 film was directed by Deepa Mehta and is the third film in Mehta's "Elements" series. "Fire" was released in 1996 and "Earth" was released two years later. "Water" is set in India in 1938 and centers on the residents of an Ashram for widowed women. At that time, India was still under British control and it was not uncommon for children to be married to much older men. Sarala Kariyawasam plays the role of Chuyia, a seven-year-old girl whose older husband dies. She is sent to the Ashram, where her head is shaved in accordance with the customs. But she is not happy in her role as a widow and seeks a new life for herself. But a new life isn't that easy to find in a society where such girls are thought of as little more than chattel. As the film progresses, one young girl is sent into prostitution and another is locked up in order to prevent her from running away with a boyfriend. After a long string of increasingly sad twists, Chuyia does find her new life. But not without serious emotional costs. Water is currently available to watch and stream, buy on demand at Amazon, FandangoNow online.